Neopia is a huge place and there is so much to do within the many worlds of Neopia that quite often you can forget the main purpose of being here: looking after your beloved Neopets! Hours can be spent repeatedly playing the same game over and over again in an attempt to obtain that game avatar or secure a place on the highscore board so you can show off that shiny new trophy. Whole days can be lost by trawling through the Neopian shops or scouring the Trading Post hoping to grab that rare stamp for your stamp album, or find one of the much desired items on your wishlist to place proudly in your gallery. All the while you're concentrating on improving your account so you can brag about your achievements on the Neoboards, or making some neopoints so you can gleefully (and greedily!) watch that bank interest rack up, it's so easy to ignore that tiny voice beside you saying, "I'm so bored! Please can we do something? I'm lonely! What kind of owner are you?" Yes, my friend, although your avatar count has finally reached the 300+ count and the shelves of your trophy cabinet are starting to groan under the weight of all those hard-earned trophies and medals, your Neopet - although proud of your achievements - is probably feeling a tad neglected. Ok, so he may be well-fed and pampered (after all, you pay all those Neopoints each month to send him to the Neolodge so you don't have to worry about his basic needs), but really your Neopet is lonely and craving company and friendship. A few spins on the Roo Island Merry-Go-Round with you each week just isn't enough for him. "But I don't have time to play with him," I hear you cry with frustration. "I really need to get that Ice Cream Machine avatar! That's my Neogoal right now!" Well, help is at hand! There is a way you can carry on singlemindedly working towards your Neogoals AND keep your Neopet happy at the same time. The answer is: get him a petpet! Yes, petpets are a fabulous way of providing your Neopet with constant, fun company, without being a drain on your precious time. There are literally hundreds of petpets out there and it can seem rather daunting choosing the right one for your pet. There are pretty ones, ugly ones, scary ones, cuddly ones. There really is a petpet for each occasion and each Neopet! If you're short of time - let's face it, who isn't? (That Ice Cream Machine avatar isn't going to win itself, you know) - take my advice and buy your Neopet a Rock. "A rock?!" I hear you cry, incredulously. "My Neopet won't thank me for getting him a rock!" And that is where you would be wrong! In my opinion, Rocks are the ultimate petpet! 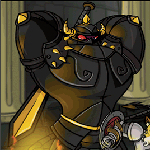 They are quite possibly the most versatile of all the petpets Neopia has to offer, and I'm here to show you why Rocks rock! Rocks are available in a variety of colours, but there are a few colours that will endlessly delight and entertain your Neopet, and perhaps even surprise you. Your Neopet will be the envy of all his friends around Halloween time when he is seen out and about playing with his Halloween Rock! If he goes trick or treating, he is sure to receive extra treats because of his petpet Rock's authentic Halloween costume. Why? Because a Halloween Rock is actually a tombstone! Think of the hours of fun your Neopet will have taking his Halloween Rock to the Haunted Woods and playing hide and seek in the graveyard there. It could take forever for him to seek out his petpet among all the real tombstones, thus freeing up extra time for you to work on your Neogoals! The Island Rock actually looks like a codestone! How confused people will be when they see that your Neopet has a codestone petpet! You could even take your Neopet and his codestone petpet to Mystery Island where they could both have hours of fun trying to fool the Techo Master at the Training School. I'll bet no one has ever tried to pay for a training course with a real live codestone before! Disclaimer: annoying the Techo Master could result in your pet being possibly banned from the Training School, but it would be worth it just to see the look on the Techo Master's face when he sees a codestone walking towards him! The Desert Rock looks like the hieroglyphic-covered monolith that is Coltzan's Shrine. Your Neopet and his petpet could spend their days in the Lost Desert watching as the hordes of tourists approach them, visiting what they think is Coltzan's Shrine, expecting to receive gifts, only to be told on each occasion "Aw nothing has happened." Just because the Desert Rock looks like Coltzan's Shrine, it won't actually have the powers of the real Coltzan's Shrine. Oh, the hilarity! Additionally, wandering around other worlds in Neopia could be a source of great entertainment to your Neopet. After all, Neopians would not be expecting to see Coltzan's Shrine sitting casually by the Book Shop in Neopia Central for example. If your Neopet loves going to discos, or is even a Disco pet, then the Disco Rock is the perfect petpet for him, for the Disco Rock is actually a glitterball! What better petpet for your disco dancing Neopet? Having a Disco Rock could also result in your Neopet actually being more popular, because who wouldn't want to invite a pet with a glitterball to all their parties? And if your Neopet is attending a party everyday, then he has much less time to pester you to take him on the Roo Island Merry-Go-Round! When is a loveheart-shaped box of chocolates a petpet? When it's a Valentine Rock, of course! Your Neopet will love fooling everyone he meets into thinking he's offering them a chocolate from this fantastic box of chocolates. Imagine their surprise when they reach for a chocolate and are greeted with a growl from the sweet-looking petpet! It is unknown whether the Valentine Rock is liable to melt if left out in the hot sunshine, so it might be advisable to avoid hot places! If you have a Snow pet or your Neopet just likes snowball fights, then provide them with a Snow Rock petpet, which is essentially one big snowball! You won't have to live on Terror Mountain for your Neopet to enjoy snowball fights all year round, whatever the weather! Imagine the looks of surprise your Neopet will receive as he joyfully throws his snowball in the blazing sunshine! If your Neopet isn't keen on the idea of fooling people, then perhaps he may be more suited to the Plushie Rock. Beanbag-like in appearance, the Plushie Rock is the perfect petpet for cuddling up to. Your Neopet will never be short of having a soft, comfortable place to sit while he is with his Plushie Rock petpet. So, there you have it! Seven reasons why Rocks Rock and are the most versatile of all the petpets and why you should buy one for your Neopet today! There is no other petpet in Neopia that can provide your Neopet with company and friendship, and comes in the shape of a box of chocolates, snowball, tombstone, codestone, glitterball, shrine or beanbag! "You're right!" I hear you cry with excitement. "I need one for me Neopet! Where can I buy a Rock?" And this is where is gets tricky ... Rocks are a Tyrannian petpet but they're ultra rare and as such they can be very expensive, often costing one million neopoints just for a basic rock without any of the fun colours listed above. Obviously your Neopet is worth such an expensive petpet (if only for the peace and quiet you'll get), but not everyone can afford a Rock. If you can't quite afford to spend that kind of money on a petpet (after all, you really do need that rare stamp for your stamp collection ...), then I suggest buying a Pull Along Rock for your Neopets. Ok, so it's a toy rather than an actual petpet, but it looks sort of like the real thing and it's still guaranteed to keep your Neopet entertained for awhile, hopefully long enough for you to get that avatar you've spent so much time trying to get, plus at around 20k neopoints, it's a fraction of the price! Win-win.